This sells for 99 ponds (over 100 dollars) on Ebay. 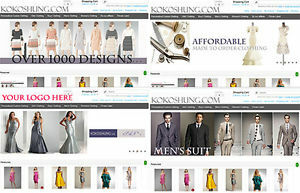 Clothing AdSense Dropship Website For Sale No Inventory required by you. start a New Business for Extra Income! The only thing you do see, is the profit ! to earn extra money every month with NO financial outlay? If so, we have an income opportunity for you ! No Financial Outlay! NO inventory to keep! 1. Start your home business with No Financial Outlay! 6. Dropshipping service-We post items to your customers directly!! 1. earn up 20%-80% rewards from our products. 2. 5%-10% commisson for 1000+ products from amazon. 3. 100% profits for your own products. 4. Resell the website and get 100% profits.